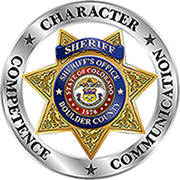 The men and women of the Boulder County Sheriff’s Office provide a tremendous level of service to our many communities with great character, competence, and open communication. We are proud of what we do here, and want to make sure that we are transparent with information concerning our services, and the statistical information that some may wish to know concerning those services. Data on call load, jail capacity, serious crime, etc., are important to many. So we publish this annual report in hopes that information you may desire to see is easy to find and understand. And also, so that you may learn something about us and the wide variety of public safety services we provide.